Fuga moved to Naples where he and Luigi Vanvitelli became the new royal architects for Charles III. The king was about to embark on a massive building campaign for Naples. Vanvitelli was ideally suited for that which was regal...and Fuga was to be the architect for the great public works projects that the king had in mind. The granary was typical of Fuga's designs —very big and very functional. Unlike some his works that still stand —the Albergo dei Poveri (the Royal Poorhouse), for example— the granary is gone. Whatever it was, it was too big, the source of its initial problems. There were simply not enough takers willing to store the fruits of their harvest in these seemingly endless rows of storage spaces. It was soon put to other uses—a factory to make artillery pieces and ship rigging and then a prison to hold the revolutionaries from the short-lived Neapolitan Republic of 1799. Under the rule of king Gioacchino Murat in 1809, the building was declared a barracks for troops in transit through the city. It became a hospital during the cholera epidemics of 1836 and 1837. It was also a convenient place to go ashore since the structure had been built with a good landing for all those grain-laden ships that never quite showed up. In 1846 it was turned into an infantry and cavalry barracks and is identified on subsequent maps as the Gran quartiere dei Granili, (Granili Headquarters). It served as a military barracks all the way through WWII, resisting over the years various attempts to turn it into a warehouse for maritime supplies. The old Granili was badly damaged by bombings in WWII and its last service seems to have been as a shelter for those who had been made homeless during the war. It was demolished in 1953. 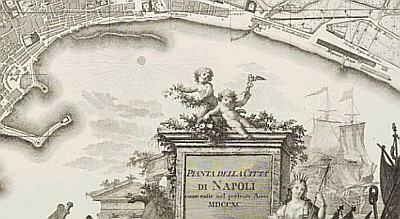 * note on the map: The map is a detail of one of the most important maps of Naples of that period. It is by Giovanni Antonio Rizzi Zannoni (1736-1814), a prominent Itaian geographer and cartographer. The section in the image is a small part of the original, which shows the entire city in great detail. The original is in the San Martino museum and is still in very good condition. It is described as an etching with the engraving by Giuseppe Guerra, also highly respected in his craft. The dimensions are 556mm x 806mm (c. 22 x 32 inches). This map and the atlas of the entire kingdom of Naples, also by Rizzi Zannoni, were important contributions to the modern mapping of the kingdom. The detail is remarkable: the granary (image, above), the new arrangement of Pizza Mercato, the Royal Gardens along the Chiaia beach, and Ferdinando Fuga's Albergo dei Poveri, accurately showing the three internal courtyards. The major fortresses--Castel Nuovo, Sant'Elmo, Carmine, the Egg Castle, are precise.